Putting it on par with two of its key rivals. While we commend Nissan for its massive styling improvement of the second-generation Leaf, the car delivers a lackluster 151-mile driving range. Compared to the current crop of electric vehicles from Chevy, Hyundai, and Kia, the Leaf's driving range just wouldn't cut it for many consumers. Just as we were ready to turn our backs on the Leaf, Nissan revealed a new Leaf Plus with a larger 62-kilowatt-hour battery and improved 226-mile driving range. This new Leaf isn't just more practical, but it is also quicker and more powerful. The first reviews of the Leaf Plus are now arriving with one crucial piece onfinformation missing - the price. 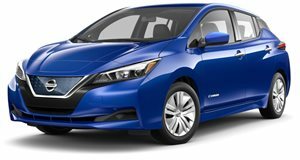 Nissan remains tight-lipped on how much the Leaf Plus will cost but an undisclosed source told Automotive News the car will "start at about $36,000, before tax incentives." If this information turns out to be true, the Leaf Plus would be directly on par with the Chevy Bolt ($36,620) and the Hyundai Kona Electric ($36,450) which have ranges of 238 and 258 miles respectively. The Leaf will be short on battery range by a few miles compared to the Bolt and Kona but this shouldn't stop it from selling. Sales of the Leaf rose by 31% in 2018 to 14,715 vehicles and we believe there will still be shoppers out there who don't want an electric SUV like the Bolt and Kona, giving the Leaf a unique advantage to set it apart. All three of these EVs are a bit more expensive than the base Tesla Model 3's $35,000 price for the 220-mile range model but this version has yet to be made available for order. Nissan will continue to sell the Leaf with a smaller battery for shoppers seeking a more affordable price, similar to how gasoline cars can be sold with a four-cylinder turbo or a more potent V6 as an upgrade. The 151-mile range Leaf has a starting price of $29,990, making it a more affordable option for drivers with short commutes. Those who opt for the larger battery will also receive a 45% bump in power to 213 horsepower and an increase in torque to 250 lb-ft. Nissan should reveal official pricing soon, so we'll be able to further compare the Leaf Plus to its competition.